Is Maui only for the rich to enjoy? Some folks think of Maui as a special place appropriate only for lifetime events like a 25th wedding anniversary, honeymoon, or maybe a retirement celebration. And indeed, Maui is a great place to splurge with posh resorts, stunning vistas, excellent restaurants, all in a relaxed environment. This has perhaps earned Maui a reputation as an expensive destination that only the rich can enjoy on a yearly (or more frequent) basis. So I ask the question, “Is Maui only for the rich to enjoy, or can it be an affordable vacation location?” I believe Maui is within reach of most middle class folks as a yearly vacation spot that is affordable, but more magical, mysterious, and quintessentially tropical than anything you will find on the mainland. 1) Lodging: Yes there are $500/night rooms on Maui that are unbelievably luxurious. But you CAN find good, clean, conveniently located condos on Maui for LESS THAN $100 a night! Look here for more information on affordable lodging and condos on Maui. 2) Food: Yes there are exotic, incredibly beautiful and delicious restaurants on Maui that will set you back $80 or $100 per person. But you can also find awesome grinds for $10/person, and if you rent a condo with a kitchenette, you can eat in and save even more money. Look here for more information on eating on a budget on Maui. 3) Free or nearly free activities on Maui: it costs nothing to hang out on the best beaches in the world. NOTHING! 4) Airfare: This one is hard to get around, since Maui is 2000 miles from any other large land mass. It may represent the largest expense item in your Maui budget plans, but with pre-planning, and using miles from business travel that you may have, you can get the price down to a reasonable level. Part of the magic of Maui is where it is located….in the middle of the Pacific, far away from the rest of the world. As your flight nears the islands, and you catch glimpses of the coast through the clouds, you’ll realize you made the right choice to come to Maui! 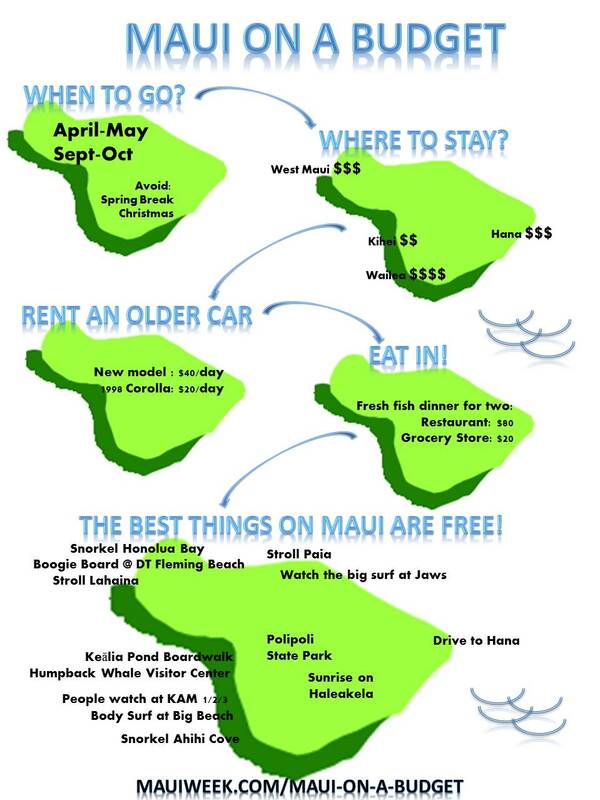 For more ideas on how to visit Maui on a budget, check out my page on “Maui on a budget“.